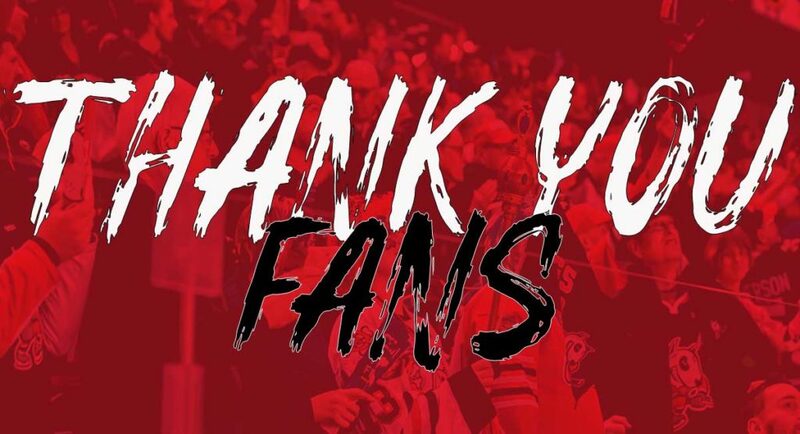 The IceDogs continued their Eastern Conference Quarter-Final series tonight in Game 4 in North Bay. 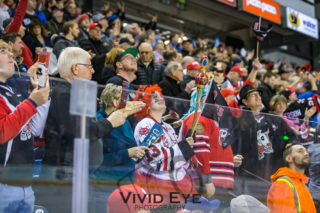 After shutting out the Battalion in their home rink, the ‘Dogs were ready for the battle that this game was going to be. 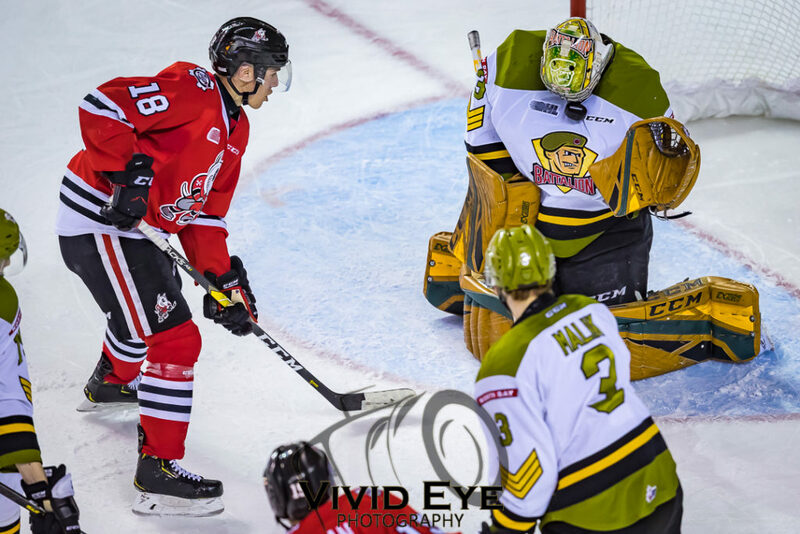 The first period got off to an intense start with the IceDogs trying to establish a fast paced style, while the Battalion tried showing their physicality. The Troops’ physical play ended up disadvantaging them, as the ‘Dogs were awarded two power plays of the period and they capitalized on both! Just before the 10 minute mark of the period, Drew Hunter picked up a loose puck deep in the offensive zone and made no mistake shooting the puck into the nearly open net! Philip Tomasino and Ivan Lodnia were credited with the assists on Hunter’s game opening goal. Then, just a minute later, Jack Studnicka capitalized from the slot on another power play to give the ‘Dogs a 2-0 lead! Akil Thomas and Matt Brassard were credited with the assists on the second goal of the period. 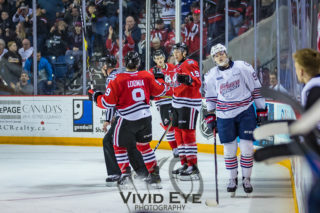 Although the IceDogs took two penalties late in the opening frame, Niagara’s penalty kill came up big to maintain the 2-0 lead going into the middle period. Philip Tomasino extended the IceDogs’ lead to 3 on a breakaway 6 minutes into the second period, after being sprung by Oliver Castleman! The Battalion brought themselves within one with 5 minutes to play in the 2nd. Then, the Battalion’s physical play was kicked up a notch after Walker and Dhillon got mixed up in Stephen’s crease. The activities resulted in several penalties assessed to each side. A breakdown can be found here. The physicality continued in the third period. Oliver Castleman scored to give the IceDogs a 4-1 win off a feed from Philip Tomasino. The Battalion scored two late goals to bring themselves within one, but Elijah Roberts attempted to clear the zone with 20 seconds remaining, and ended up scoring an empty net goal. 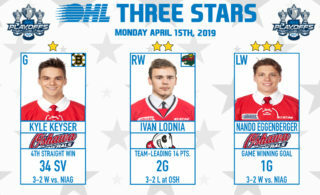 The IceDogs took Game 4 by a score of 5-3! In the third period, Matthew Philip was taken off the ice on a stretcher. We will provide an update on our social media pages as soon as possible.